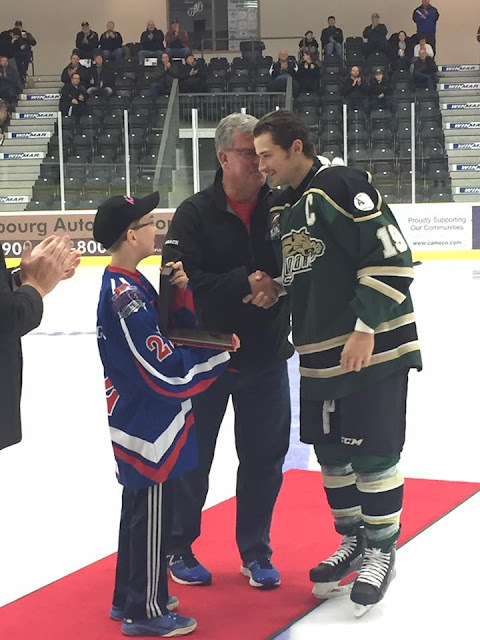 Tonight ex Peterborough Pete and present Cobourg Cougars captain Josh Maguire was honoured in a pre-game ceremony in Cobourg. 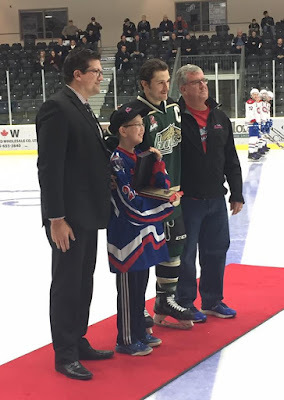 Andrew Avery, a 6 year veteran with the Komets, and his head coach Steve Cole presented a plaque of appreciation to Josh Maguire. The Kawartha Komets Special Needs Hockey Program, based in Peterborough is now in its 8th season with four teams and 65 players. Andrew Avery, one of the Komets’ Junior players, is now in his 6th season with the team. 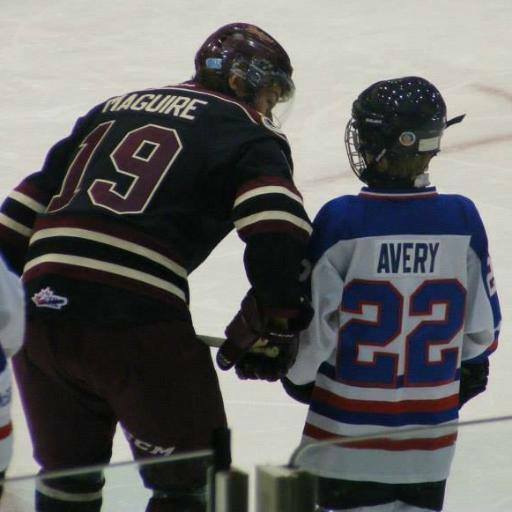 Andrew, a Cobourg resident, and Josh Maguire forged a friendship which was nurtured each season for the past four years when the Kawartha Komets played the Peterborough Petes in their annual fundraising game. 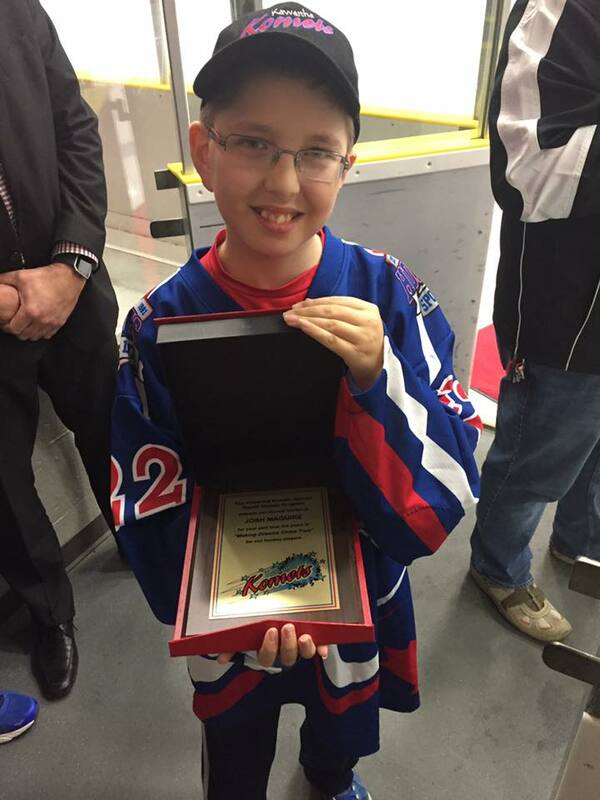 Last year, for his fundraising efforts with the Komets, Andrew was awarded “Dinner with a Pete”. Josh Maguire had agreed have “dinner with the winner” and it worked out perfectly that Andrew and Josh would enjoy a meal together at the Whistle Stop Café in Peterborough. Last season Josh Maguire donated the proceeds from his annual golf tournament to the Kawartha Komets and this was much appreciated. The Kawartha Komets and Andrew Avery are pleased to present this token of appreciation to Josh Maguire for his support of the Kawartha Komets and his personal involvement in the lives of the Komets players. CONGRATULATIONS and MANY THANKS, Josh!